If a second date happens, you know it’s got potential. In fact, it might have been love at first sight and really the rest is just history waiting to happen. If there wasn’t potential, why would you be going on the second date anyways? Don’t answer that. Seriously though, never go on a second date if you already know there’s no potential. You’ll just be miserable. And then you’ll be left asking yourself all the why’s and hatin’ on yourself for wasting so much time and effort. Don’t be a hater. Be a lover. Do you guys remember the first date? It was so kitchen cooking magical (…far off dreamy gaze). It was called Date Night Gnocchi. We’re all things food on this blog so if you thought I was talking about people dates, wrong blog my friend. But while we’re on the topic, listen up…DO NOT go on the second date if you already know it’s a no-go. An awkward no-fun second date makes me squirmy inside just thinking about it. Move on my friend. There’s your free dating advice. I’ll be waiting for my thank-you card in the mail. But the gnocchi YA’LL…the gnocchi is coming back for a second date! And this time it’s a little bit on the spicy side. Ooo-la-la. It’s Date Night Gnocchi, Part 2, Chapter 2, Round 2, just get on my fork and in my mouth sequel. Or let’s just call it Gnocchi Marinara with Sausage & Peppers. And it comes together faster than you can drop the news to the second date that there won’t be a third date. Still talking food here. Adios dinner gone wrong with whatever that was you just made…again… And if it is a real date you gotta end, not just one with a sad pile of food, this dinner will definitely come together faster than that conversation too. Unless you’re the kind of person that stands up suddenly and says “Gotta go! Something’s come up!” and runs out the door. 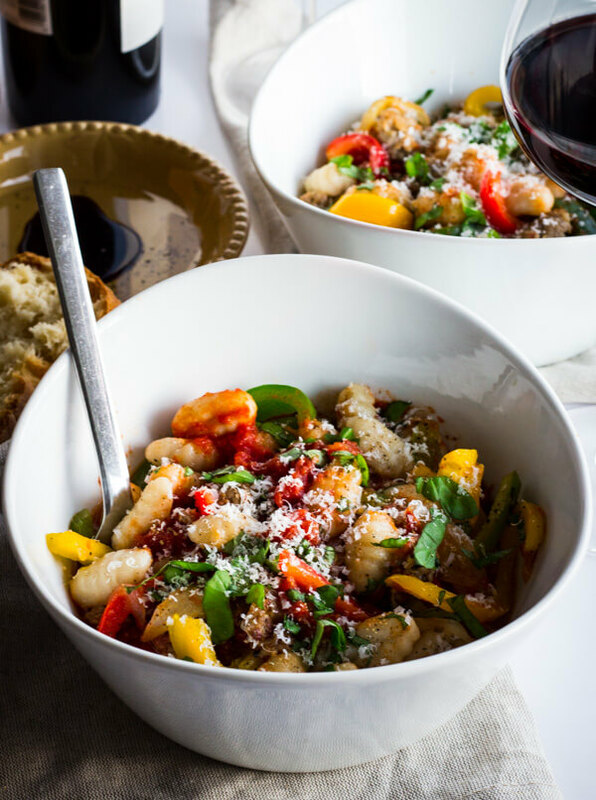 In that case you just run yourself straight home, make this gnocchi, and let all it’s glorious flavors serenade you with its beautiful love song. 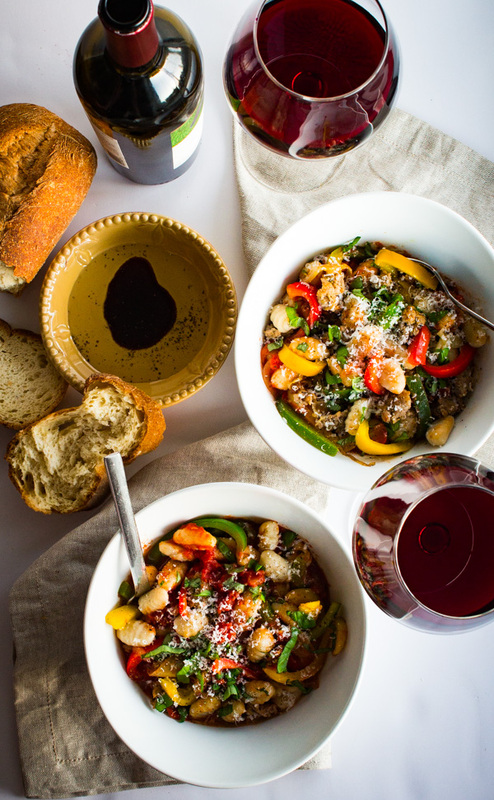 The gnocchi won’t let you down. So here’s how this second date goes down. Cook some Italian chicken sausage with some thinly sliced onions. Add some peppers. Red, yellow, green. Eat the rainbow baby. While the sausage, onions, and peppers are doing their thing, cook the gnocchi. Only 4ish minutes for the lil’ dumplings. Then all you gotta do is add your prepared sauce to the pan with the sausage and peppers and let it warm up. Yep, that’s right. Save some time and buy a jar of prepared garlic marinara at the store my friends. There’s no shame in using prepared sauce. Save the homemade sauce for the third or fourth date. We can agree on taking the easy sauce route, right? I thought so. Especially if you’re the one that just ran home from that second date gone wrong. 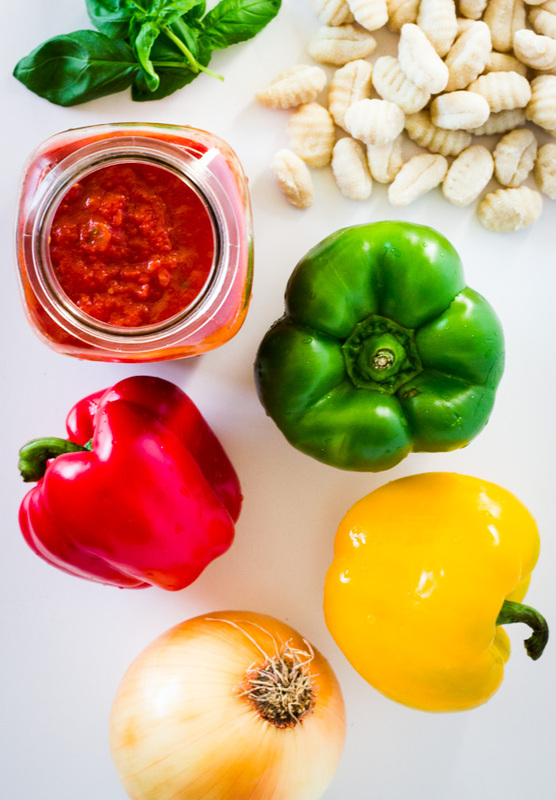 Just make sure to check the ingredients list on the back of the jar and buy a marinara with no sugar added. Like this one, which can be found in just about any grocery store. We don’t need added sugar in our sauce. If it means spending a little more cash for the good no sugar added sauce, do it. 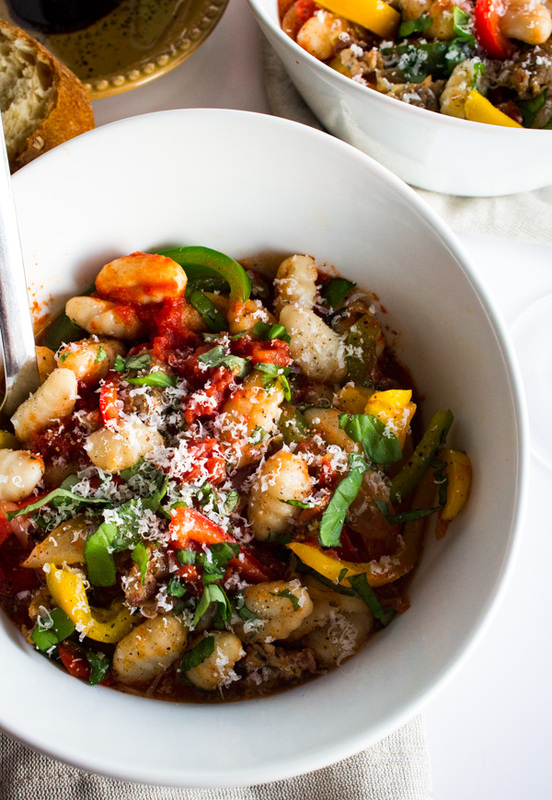 Your body will thank you and so will the gnocchi. Lastly, add the cooked gnocchi to the saucy mixture. Stir it up. Serve it up. And don’t forget to top it off with fresh chopped basil, freshly grated parmesan, and some ground black pepper. 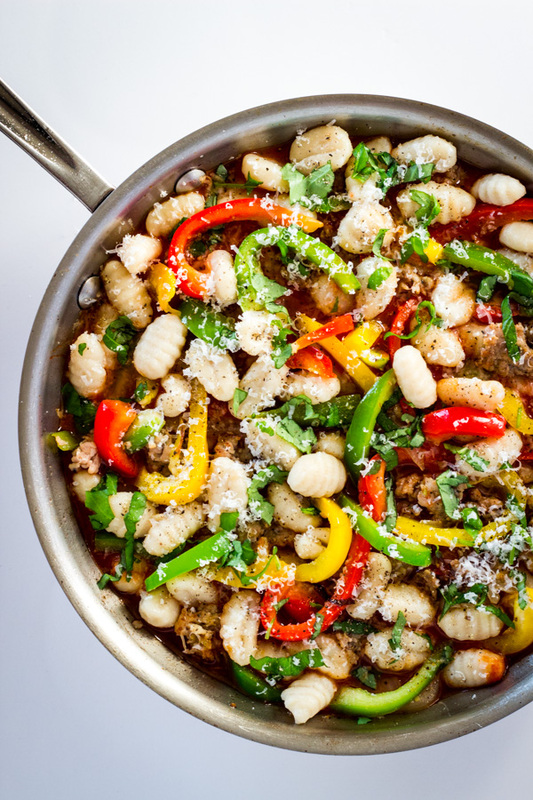 Gnocchi Marinara with Sausage & Peppers, I’ll date you any night. P.S. Bring some crusty gf bread and a bottle of red too. 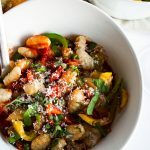 Gluten free gnocchi saddles up with sautéed Italian chicken sausage, onions, peppers, and garlic marinara for a slightly spicy & satisfying 20-minute meal! Heat olive oil in a large skillet over medium-high heat. Add the sausage and onion. Sauté until the sausage is slightly browned and onions are softened, about 7-9 minutes. Add the peppers and sauté an extra 3-4 minutes, just until the peppers are slightly tender. Add the garlic marinara and let it all simmer until sauced is warmed through and your gnocchi is cooked. In the meantime, cook the gnocchi in boiling water just until they begin to float to the top of the water (about 4 minutes). Drain. Add gnocchi to the sausage, peppers, and sauce mixture; stir to combine. Remove from the heat. Plate it up and serve garnished with fresh chopped basil, freshly grated Parmigiano-Reggiano, salt, and pepper to taste. Eat and then go back for seconds.